Treasure Chest - a voice of New Life Church in West Linn, Oregon: Middle School Youth Retreat, June 27-28: The Invisible Shield taken from the life of David. Middle School Youth Retreat, June 27-28: The Invisible Shield taken from the life of David. The Invisible Shield is the shield of faith. It is strengthened and enhanced by Godly character traits like courage, resourcefulness, honor, loyalty, mercy, purpose, service, sacrifice, preparedness, righteousness, prayer, and a desire to do great things for God. THE LEAD OFF LESSON...was taken form the account of David’s battle with Goliath and illustrate how even though he shunned the shield and armor of the King he was protected by an “Invisible Shield” of his faith in God when he told Goliath that he was not afraid of him and that he would be defeated because he had defied God. THE CORE ACTIVITY...was the construction of a functioning shield with a “coat of arms” made up from icons we used in the lesson series to represent the various character traits we taught about. The background colors of the shields also had significance and meaning. 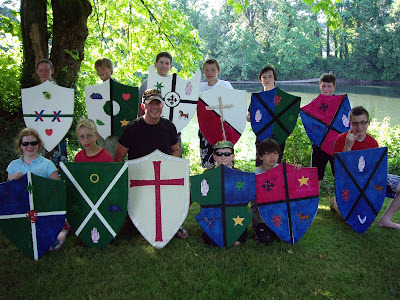 Each shield is a unique shape and design selected by the student. There is a “Legend” that has a wide selection of icons and traits and explains the meaning and key verse for each from David’s life. The wood for the shields was taken from materials salvaged, or “redeemed” from the church in what is now Pastor Scott’s office and this will be given special significance to teach about redemption and salvation. TEAM-BUILDING GAMES...The team names in the games will also be taken from the icons, such as “Horses” – Ready for Battle vs. “Lions” – Loyal Leaders. MEALS...The students enjoyed lots of good food including a meal of “wild bear meat” cooked over the open fire during the kick off lesson as Scott Haugen tells the story of David and his courage protecting sheep against a bear and a lion and his Invisible Shield that protected him. Thanks, Scott, for sharing the pic and details of the retreat. The picture is a good one! This was another memorable retreat for Gregory. Thanks to the middle school team for all they have done and are doing to contribute to the spiritual health of our kids!